At Spike’s Trophies, that’s what we’re all about. 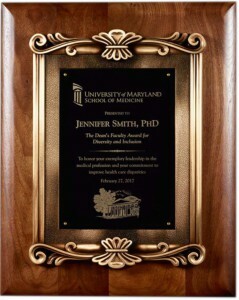 Our custom engraved plaques are absolutely perfect ways to preserve your treasured memories and notable accolades. They also make the perfect gift for someone who’s made a positive impact on you, or on the world. A plaque can be a declaration of success, a keepsake honoring a milestone, a “thank you” to a mentor, or anything you want it to be. Spike’s takes your shining moment and turns it into a piece of art that you can hang with pride in a living room, an office, the hallway of a school – anywhere. It’s something that will always bring a smile to your face and the faces of others. There really is nothing we can’t do with a plaque, and with Spike’s Trophies, you can always count on a job well done. Why hire someone to memorialize your favorite moments if it’s going to turn out looking shoddy? We use the highest quality materials to make a plaque you can truly be proud of, a keepsake that’s worthy of hanging on your wall. Our custom plaque engraving services allow you to call the shots in terms of what your plaque says. Our expert craftsmanship makes the finished product sparkle. If you need a special gift for a loved one, a teacher, a coach or anyone important, or you just want to add some more swag to your own wall, give Spike’s a call. We can’t wait to see what fun project you have in store for us.